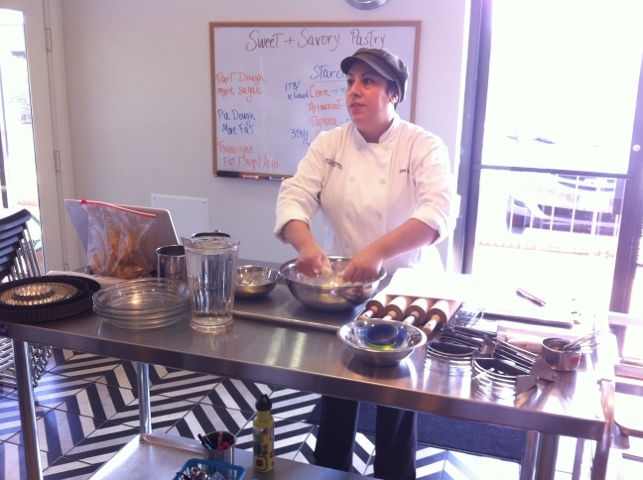 Wednesday started with a pastries lab that included sweet and savory pastries. We made scones, pies, tarts, and empanadas. I made an empanada dough (from regular wheat flour) and it was really loose. I was worried that the dough would not hold together, but I chilled it according to the recipe and that helped a lot. I don’t do much baking, so working with dough is pretty unfamiliar to me, so these labs are really useful for me to advance my knowledge. 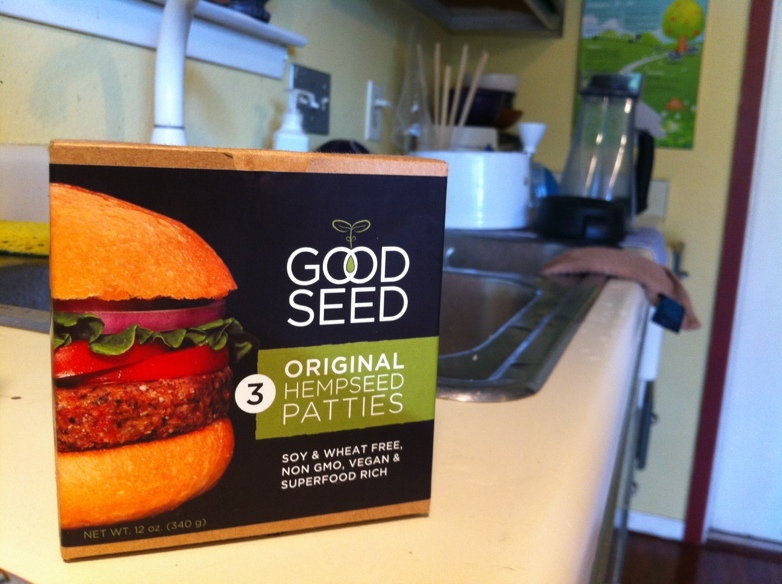 Some of the recipes we worked with were gluten free, so I got to enjoy those. One of my favorites was a gluten-free pear pie. Mmm! 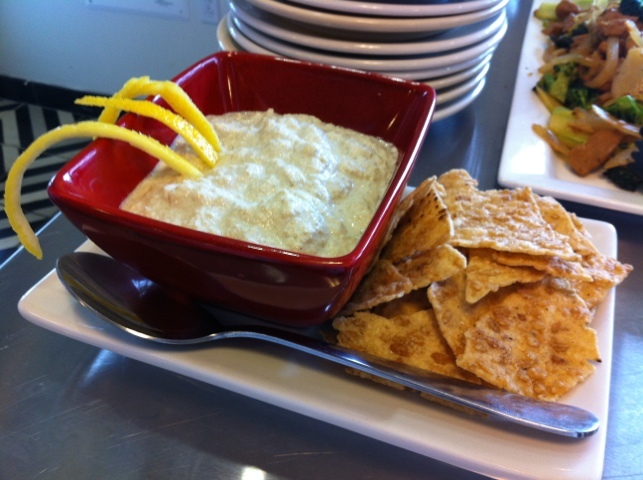 Below: Chef Alex did a demonstration of fruit crostadas. Below: The goodies from Johnson’s Backyard Garden. A photographer from Johnson’s Backyard Garden showed up to shoot our use of their CSA boxes. 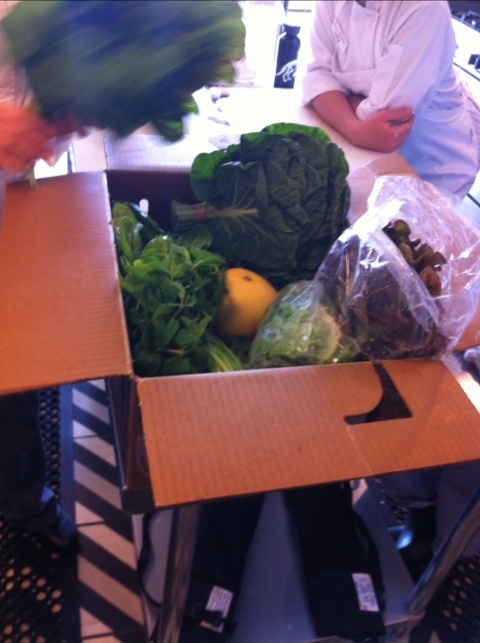 Chard, Brussels sprouts greens, beets, mint, carrots, and more were included in this week’s box. 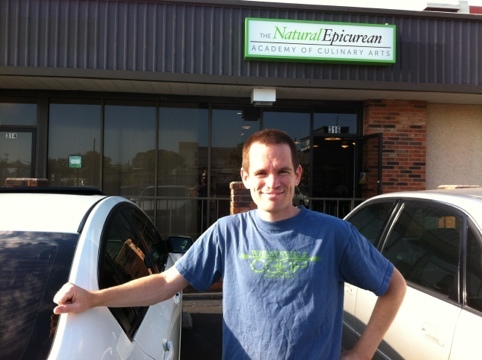 The Natural Epicurean has been a heavy user of Johnson’s produce – we cook with it every day – and it’s nice to know that the school buys locally, so the produce is fresh, in season, and has minimal ecological impact from transportation. Below: Photographer from Johnson’s Backyard Garden and a woman taking notes on our handiwork while Chef Rachel (center) looks on. 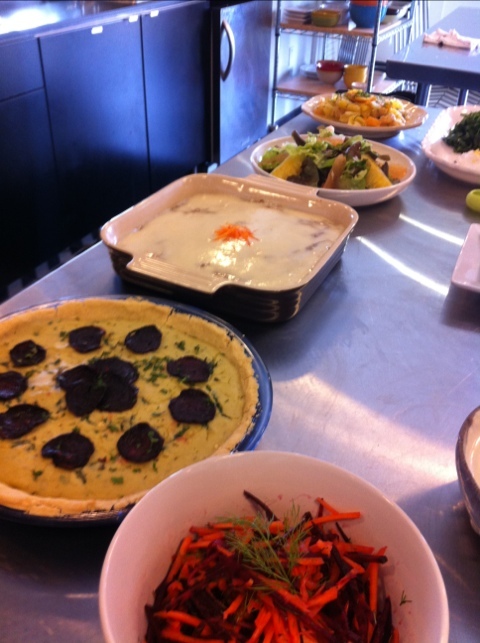 Below: My team’s beet-pepperoni pizza (left), carrot cake (center), and citrus salad (above the cake). Below: An artfully assembled de-constructed beet-chard salad. 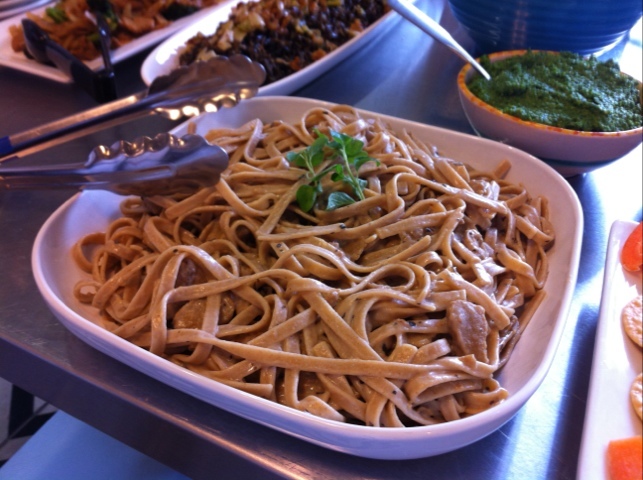 Thursday we got to work with seitan, sunflower seeds, and walnuts, making vegan versions of several non-vegan dishes (1) fettuccine (2) mayonnaise (3) pesto and a handful of others. 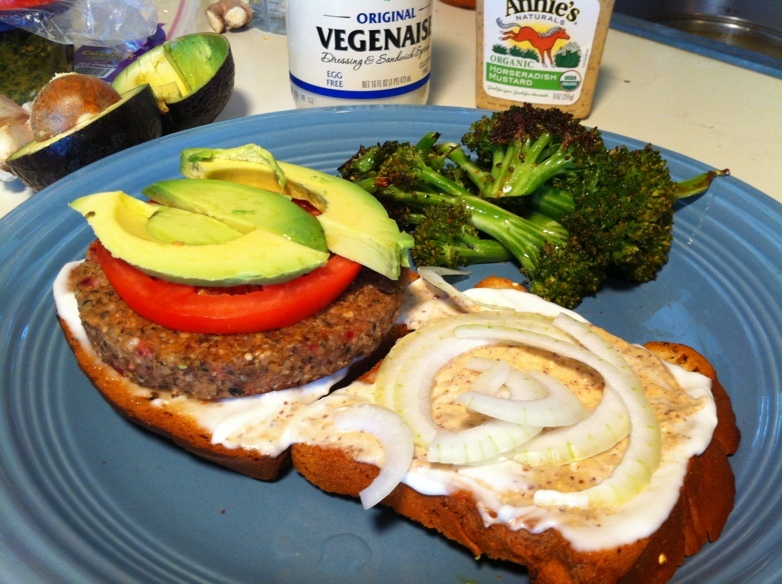 Seitan is a dense, chewy brown colored mass of wheat protein – otherwise known as gluten. Gluten has become a very well-known word in America, although people still don’t understand what it is. At The Natural Epicurean, we are going to be making our own seitan in a future session, but I can tell you it is made from wheat that is ground into a flour and then rinsed and wrought until the starches are washed away and the gluten only remains. 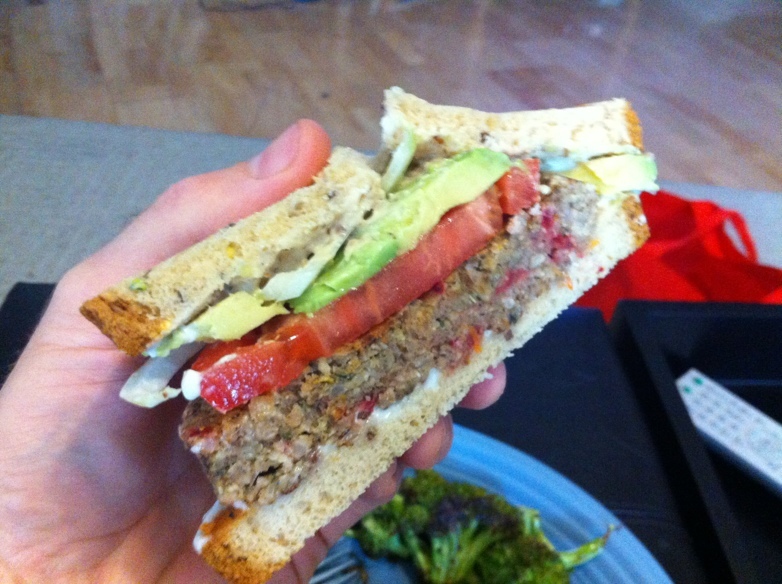 What you’re left with is seitan – it’s thick, and it closely resembles meat because of it’s density and chewiness. However, since I am gluten sensitive, seitan was a no-no for me. I did cook with it, but I just didn’t eat any. Below: Sun cheese, made from soaked sunflower seeds. Sun cheese tastes pretty dang good! And nice presentation! Lemon juice adds some of the tangy flavor that you usually get with cheese. A Vita Mix helps it get nice and creamy. All four teams made sun cheese so we got to compare final products and discuss. 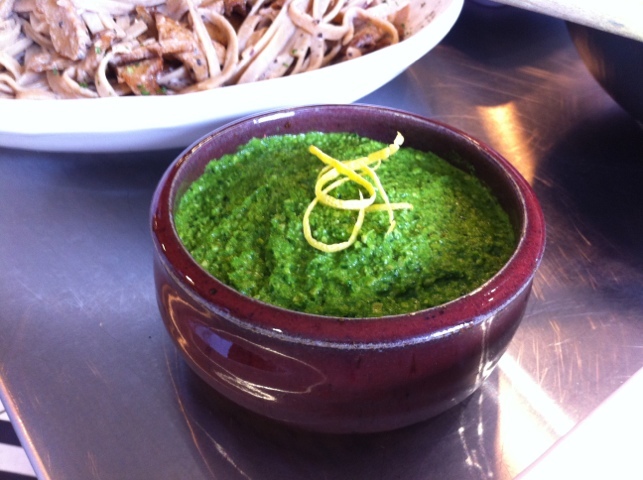 Below: Cilantro/parsley pesto with pumpkin seeds instead of pinenuts. I plated this dish and I love the red clay bowl against the green pesto. 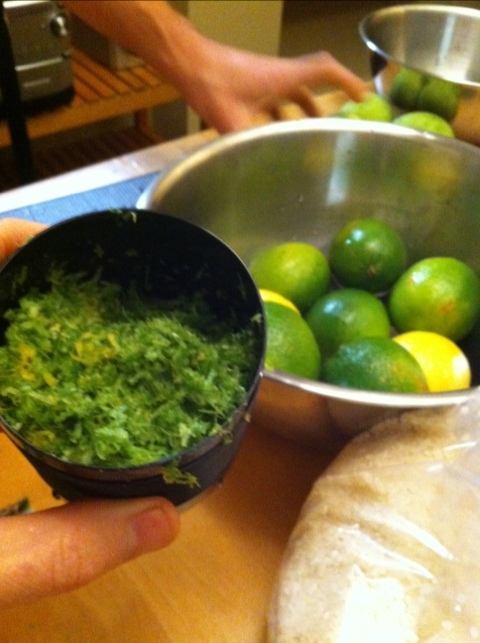 The yellow lemon zest was a lovely addition, also. 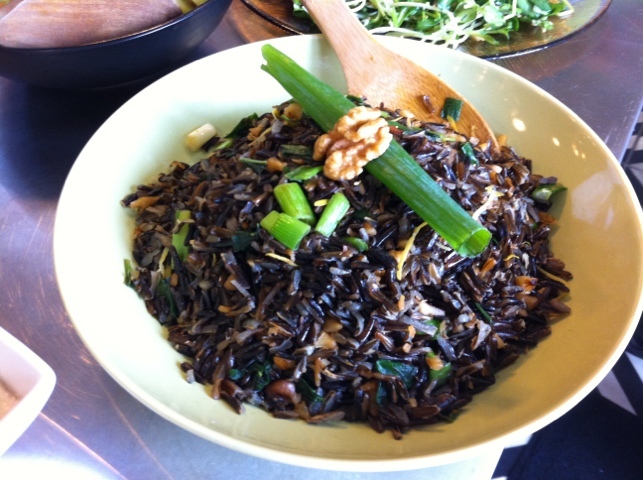 Below: Wild rice stir fry with walnuts. Below: Sun cheese and pesto. 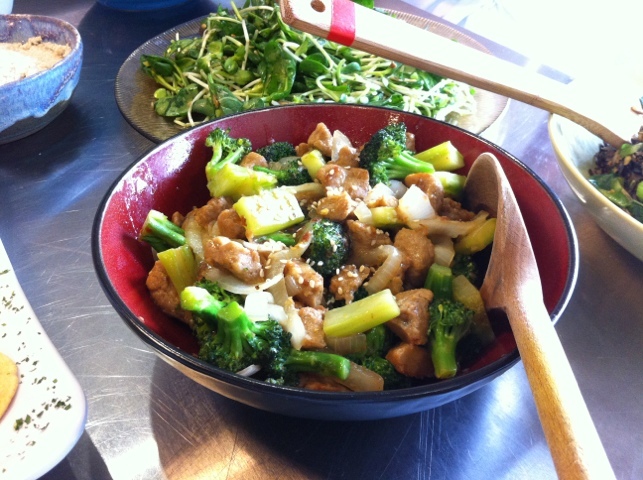 Below: Seitan saute. The sauce was delicious. It’s been 4 weeks since I began culinary school at The Natural Epicurean and I figured that I would show my family, friends, and blog readers what it looks like in the kitchen where I am spending my time! There are four stove tops in the kitchen. I have never had to wait to use a stove since there are plenty of burners. Occasionally, just as in a restaurant kitchen, we have to work with our colleagues to move a saucepan to another burner to make space for a new pan, but that is part of the cooking process – working with our colleagues to get the job done. There are four stations in the kitchen for students, and two instructor stations. Each station is stocked with a food processor and all of the cookware and utensils you need to prepare a given dish. There are two Vita Mixes in the kitchen and I haven’t seen us need more than that. Food dehydrators, as seen in the video, are “cooking” devices which operate at very low (100-118 degrees or so) temperatures and for long periods of time (up to several hours or more). The dehydrating process has minimal impact on the enzymatic composition of the food and its nutrient profile, while altering the texture slightly. Dehydrated eggplant slices, for example, are very crispy and make a nice sandwich filling. The dehydrators are Excalibur models and I don’t know much about them, but I look forward to finding out more very soon! There are about 12 students in the lab kitchen at any given time – three in each sub group. The sub-groups (or teams) rotate each week. 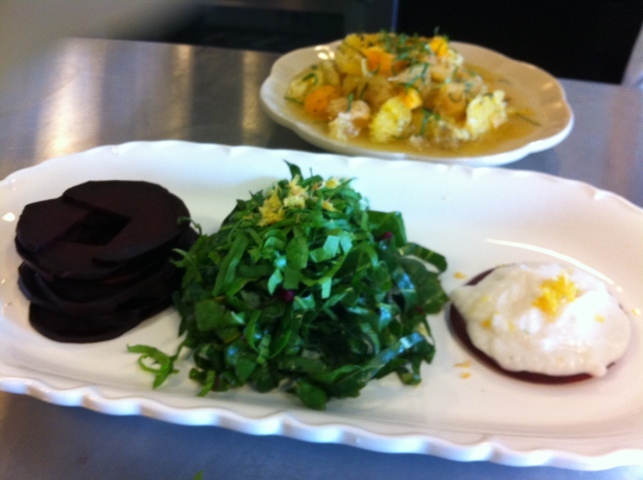 When in the lab kitchen, I work with two other students on preparing 2 to 4 recipes. At the end of the lab, we all taste the food and share comments on it. 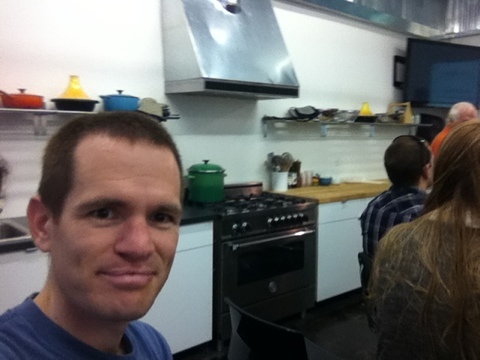 When the lab session is over, we move to the demo kitchen. The students who were in the demo kitchen switch to the lab kitchen. I’ll be making more videos to explore the kitchen in more detail in the future, so stay tuned! You probably know that iron is a required nutrient in your diet. But why? And are you getting enough? Where can you get it? Don’t you need to eat lots of meat to get enough iron? Iron is used by each cell in your body for metabolic processes required for life. It also helps transport oxygen from your lungs to all parts of your body because of it’s presence in hemoglobin. Hemoglobin is part of red blood cells. Deficiency can result in fatigue, weakened immunity, and in infants can result in developmental problems. 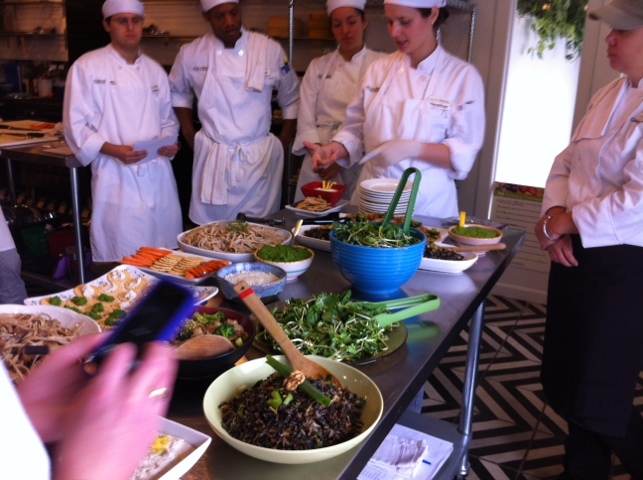 Today was an open house for The Natural Epicurean, the culinary school I’ll be attending starting in February. They had a short talk on using the underutilized – yet delicious – parts of plants and Mason Arnold, the founder of Greenling local produce delivery, presented on sustainable and local food sourcing. 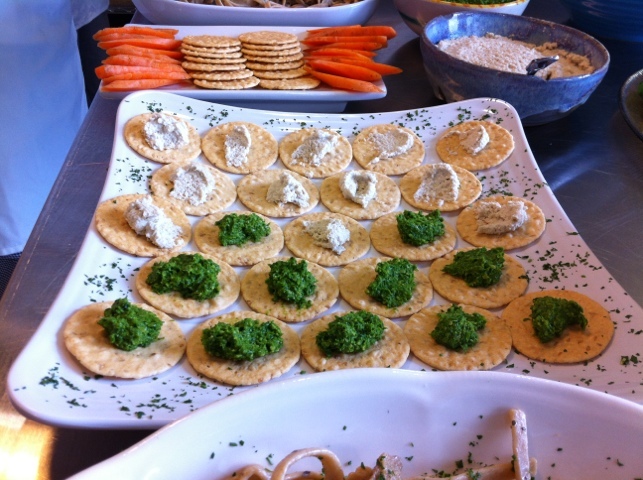 They also had some Q&A about the school and some of the students made an array of delicious appetizers! On top of it all, I got to speak with several staff of the school, including owner Rich Goldstein. Everyone talked about what an exciting time it is in the world of food and health, and I’m feeling very positive about the direction I’m heading! I’m really looking forward to starting the program and meeting new people who are enthusiastic about food and living healthfully. Above – In the demo/lecture space, which is a new expansion for the school. 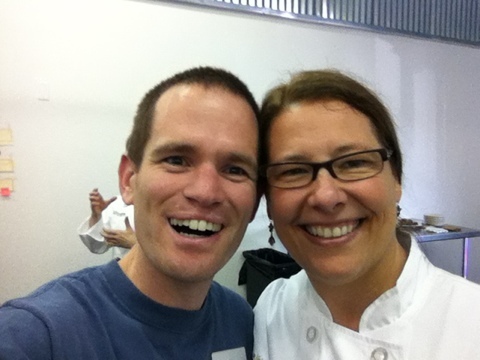 Above – Me with Maya Farnsworth, Managing Director of The Natural Epicurean. 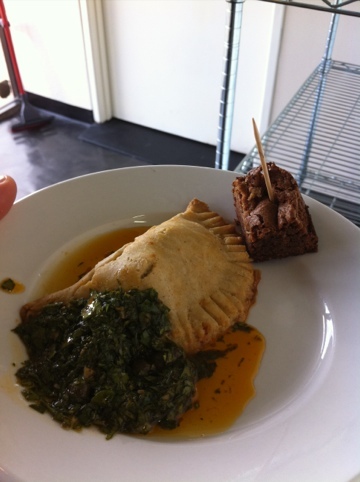 Above – Gluten-free empanada with an amazing Chimichurri sauce and a gluten-free brownie bite. 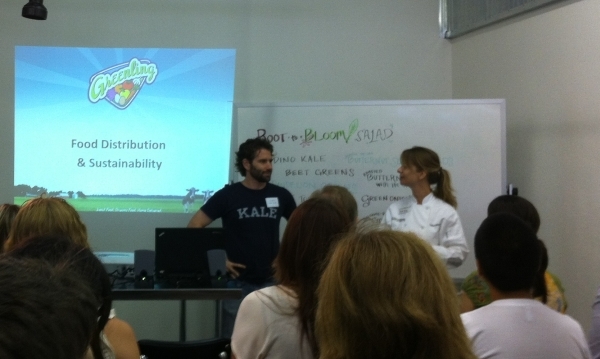 Above – Greenling Founder Mason Arnold talks about distributing local and sustainable food, with Amy Ramm, founder of Nada Moo, a local (soon to be national) vegan ice cream brand. 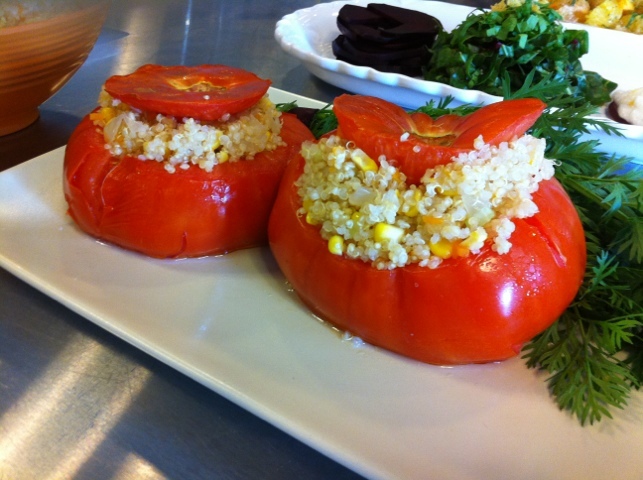 Amy is a graduate of The Natural Epicurean and an instructor. The program will last about 9 months, with a large amount of classroom time plus two chunks of required internship and externship hours. Followed by that, I expect a lot of hard work and learning on my path. I learned that most of the students come from outside of Austin just to attend the program, and it sounds like the school is planning some big things to grow its presence in the world of healthful food education. This open house was a great chance to meet more people, learn more about what the school is about, and whet my appetite for more! Mission accomplished!